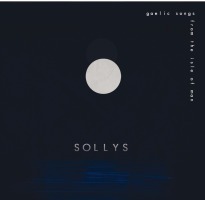 Sollys - which means 'light' - gathers together 30 songs in Manx Gaelic. Mainly unaccompanied, they show the range of material currently being sung - old words to new tunes, new words to new tunes as well as traditional material from the manuscript collections. Featuring fourteen well-known singers: Bob Carswell, Aalin Clague, Bill Corlett, Cairistiona Dougherty, David Fisher, Jonee Fisher, Hillary Gale, Phil Gawne, Sarah Hewson, Greg Joughin, Ruth Keggin, Clare Kilgallon, Annie Kissack, Julie Matthews and Caarjyn Cooidjagh, the CD features solos, duets, trios and even one choral piece. LISTEN to a traditional Manx song about the 1787 loss of the herring fleet in Douglas harbour, Coayl jeh ny Baatyn Skeddan, performed by Phil Gawne.